In 1972, I started college in Albany, New York. I was in a special program, a college within a university. On Thursdays, we all met for integration, a full afternoon of lectures and discussions. Integration was a great time to knit away on a scarf or hat or even an afghan. And if I happened to be out of yarn, integration was an excellent time to skip out and shop for more. That is how I discovered Dora's Yarn Store. 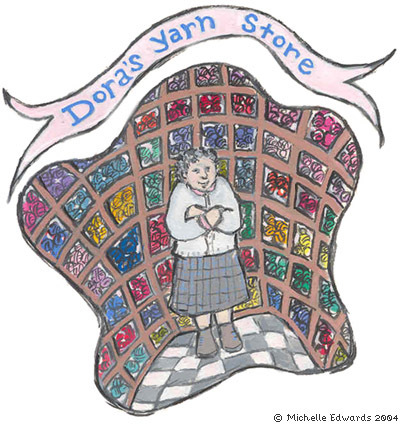 When I close my eyes and recall Dora's Yarn Store, I see the color gray: gray sidewalk, gray door, gray dusty windows and a gray-haired Dora wearing an old gray cardigan. She was no more than 5 feet tall, but with her step stool, she knew how to reach all the nooks and crannies of her little shop with its floor to ceiling cubbies filled with yarn. I started making my way down to Dora's to buy yarn and to escape from college life. I loved being surrounded by the quiet and familiar warmth of a yarn store and the comforting presence of Dora, who was always the only person working there. I brought my friends to Dora's, too. And that is how I came to be Dora's courier. My friend Roberta, who by then was also a Dora's customer, bought some cotton yarn. She told Dora she was making me a crocheted travel bag for my upcoming trip to Israel. Dora asked to see me before I left. Could I bring some yarn to her sister-in-law who lived in Jerusalem? Bringing gifts to friends and relatives, items hard to find or expensive to purchase, was a very common request of travelers to Israel back then. And it was one that was always honored. Dora carefully chose four skeins of dark blue wool and gave them to me with her sister-in-law's address. A friend helped me find Dora's sister- in-law's elegant apartment in the wealthy Jerusalem neighborhood of Rehavia. Dora's sister-in-law showed us pictures of her husband with Ben Gurion and Golda Meir. She told us that her son or husband or nephew, I can't remember which, had translated Darwin into Hebrew. What a family, I thought. As I listened to these stories of Dora's family's accomplishments, I knew that I couldn't leave without asking. Nicely, I hope. Why? Why did Dora have a shop in the decaying downtown of Albany, New York when she could spend her days in Jerusalem with her family, rubbing shoulders with the elite? She could even have a yarn store in a charming neighborhood like Rehavia. The answer Dora's sister-in-law gave wasn't really an answer. It seemed to me then it was story, a sad, familiar story about the eldest daughter in a very traditional family. She goes to America, works hard and opens a yarn store. She sends the money her family needs, first to Europe, then, to Israel. The family survives and prospers because of her hard work. Their success is her enjoyment. Now old and settled in her ways, her yarn store is her home. When Dora's sister-in-law finished her story, I knew my visit was almost over. I reached into my already travel-worn travel bag and pulled out the four skeins of navy blue wool. Dora's sister-in-law was an educated, wealthy and well-connected woman. On that cold Jerusalem evening, she wore a beautifully tailored tweed suit and served us tea and cookies on fine china. It was hard for me to believe that this woman would need or want such plain and ordinary yarn. But she was gracious. She admired the wool and thanked me for delivering it. As I stood to leave, Dora's sister-in-law held my arm for a moment. "I once went with Dora on a buying trip to Chicago," she told me. "Everywhere we went, people knew Dora. She is very knowledgeable about knitting and yarns. When she talked, they listened." As I moved around the next few years trying to find my way in the world, I always tried to stop by and visit Dora when I was in Albany. She was old when I first met her, but on my last visit she seemed so much smaller and grayer and older. When she died, I was back in Israel, studying art in Jerusalem. Now that I am a middle-aged mother living in Iowa with my husband and three daughters, I realize the how the choices we make often change our lives. Now I understand why Dora didn't move to Jerusalem and bask in her family's accomplishments. Now I understand how satisfying it must have been for her to be an independent woman, to have worked hard and helped her far-flung family succeed, to have her own store filled with beautiful yarns, to be respected for her knowledge of knitting and yarns and perhaps with a cup of good strong coffee in her hand, to have been able look out her shop window every morning with a sense of fulfillment to the sign that read "Dora's Yarn Store." Michelle Edwards lives and works and knits in Iowa City Iowa, the Athens of the cornfields. 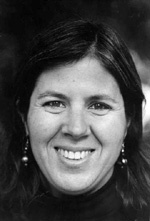 She is an author/illustrator of children's books including CHICKEN MAN, winner of the National Jewish Book Award and the Jackson Friends Series: PA LIA'S FIRST DAY, ZERO GRANDPARENTS and THE TALENT SHOW. story and illustration © 2004 Michelle Edwards. Contact Michelle.